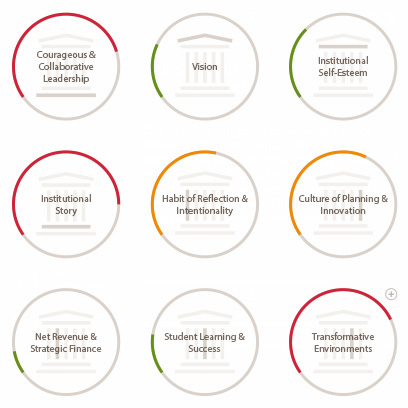 The Thriving Framework® Diagnostic Tool is a companion survey to Surviving to Thriving that allows leadership teams and boards of trustees to evaluate their own institution's level of urgency across the elements of the Thriving Framework. Corporate or non-profit user? Contact us for an account. While the Thriving Framework® Diagnostic Tool can be used separate from Surviving to Thriving, we recommend board and cabinet members read the book before or after taking the survey to set their results into a general context. For a more comprehensive unpacking and examination of your individual or your team's aggregate results, Credo's experienced consultants can facilitate a planning day for you in our offices and share insight about national higher education trends and best practices related to the survey and the Thriving Framework. 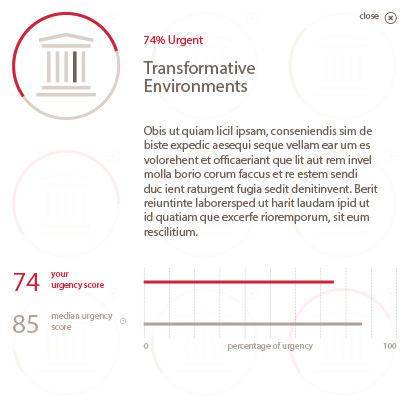 They can go into depth with you about any of the elements in which your institution is seeing a high level of urgency, with the goal of priority-setting for the most productive path forward. Have a question or comment for the Credo team, click here to email us.